Internet Explorer[a] (formerly Microsoft Internet Explorer[b] and currently Windows Internet Explorer,[c] commonly referred to as Explorer and abbreviated IE or MSIE) is a series of graphical web browsers (or as of 2019, a "compatibility solution") developed by Microsoft and included in the Microsoft Windows line of operating systems, starting in 1995. It was first released as part of the add-on package Plus! for Windows 95 that year. Later versions were available as free downloads, or in service packs, and included in the original equipment manufacturer (OEM) service releases of Windows 95 and later versions of Windows. The browser is discontinued, but still maintained. Internet Explorer was once the most widely used web browser, attaining a peak of about 95% usage share by 2003. This came after Microsoft used bundling to win the first browser war against Netscape, which was the dominant browser in the 1990s. Its usage share has since declined with the launch of Firefox (2004) and Google Chrome (2008), and with the growing popularity of operating systems such as Android and iOS that do not run Internet Explorer. Estimates for Internet Explorer's market share are about 2.58% across all platforms or by StatCounter's numbers ranked 7th, while on desktop, the only platform it's ever had significant share (i.e., excluding mobile and Xbox) it's ranked 4th at 5.34%, just after macOS's Safari (others place IE 3rd with 4.79% after Firefox), as of February 2019[update] (browser market share is notoriously difficult to calculate). Microsoft spent over US$100 million per year on Internet Explorer in the late 1990s, with over 1,000 people involved in the project by 1999. On March 17, 2015, Microsoft announced that Microsoft Edge would replace Internet Explorer as the default browser on its Windows 10 devices (while support for older Windows has since been announced, as of 2019[update] Edge still has lower share than IE's, that's in decline). This effectively makes Internet Explorer 11 the last release (however IE 8, 9, and 10 also receive security updates as of 2019). Internet Explorer, however, remains on Windows 10 and Windows Server 2019 primarily for enterprise purposes. 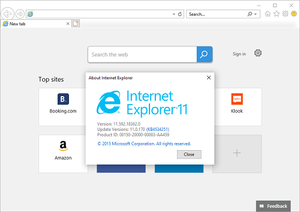 Since January 12, 2016, only Internet Explorer 11 has been supported. Support varies based on the operating system's technical capabilities and its support lifecycle. ^ a b c "Frequently Asked Questions". Microsoft Edge Development. Microsoft. Archived from the original on 2016-07-16. The latest features and platform updates will only be available in Microsoft Edge. We will continue to deliver security updates to Internet Explorer 11 through its supported lifespan. To ensure consistent behavior across Windows versions, we will evaluate Internet Explorer 11 bugs for servicing on a case by case basis. ^ Tung, Liam. "Microsoft security chief: IE is not a browser, so stop using it as your default". ZDNet. Retrieved 2019-03-13. ^ "Desktop Browser Market Share Worldwide | StatCounter Global Stats". StatCounter Global Stats. Retrieved 2019-01-03. ^ "Market share for mobile, browsers, operating systems and search engines | NetMarketShare". netmarketshare.com. Retrieved 2018-11-02. ^ "Microsoft Update Catalog". www.catalog.update.microsoft.com. Retrieved 2019-03-13. ^ "Cumulative security update for Internet Explorer: June 12, 2018: Applies to: Internet Explorer 11, Internet Explorer 10, Internet Explorer 9". support.microsoft.com. Retrieved 2018-07-12. 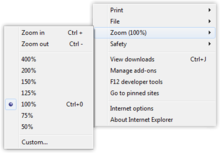 ^ "Internet Explorer Support Lifecycle Policy FAQ". Retrieved 2015-03-18. ^ "Internet Explorer". Rotten Websites Wiki. Retrieved 2018-08-12. ^ "Thomas Reardon, 34". MIT Technology Review. Retrieved 18 January 2015. 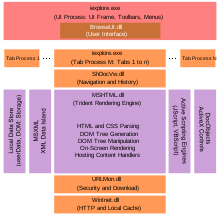 ^ "Bringing Internet Explorer 11 to Windows Server 2012 and Windows Embedded 8 Standard". 2019-01-28. Retrieved 2019-03-26. ^ "CVE-2014-1776". Common Vulnerabilities and Exposures (CVE). 2014-01-29. Retrieved 2017-05-16. ^ "Google Chrome Overtakes Internet Explorer". PCWorld. 2012-05-21. Retrieved 2019-01-19. Williams, Mary-Lynne; MacNeil, Leslie; Hall, Marty (September 17, 2010). Hachamovitch, Dean, ed. "User Experiences: Evolving the blue "e"". IEBlog. Microsoft. Retrieved December 22, 2013. 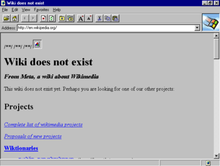 Wikimedia Commons has media related to Internet Explorer.